Time for more answers from The Answer, this time talking about the classic-to-X time interval and the disappearance of Rock’s charge and slide abilities in 9 and 10. First, let’s address the two about the Rockman => X gap. 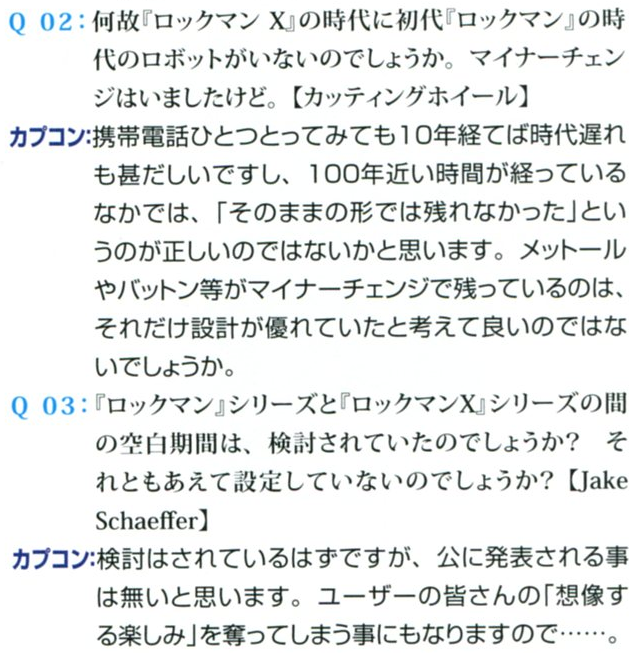 Then we’ll switch over to the Rockman section for the last question. Q02: Why aren’t the robots from the original Rockman time period still around in the Rockman X time period? Especially since there are some robots with only minor changes. CAPCOM: When you consider that state of the art mobile phones become obsolete in less than a decade, you can imagine how after 100 years you wouldn’t expect to see too many old models still remaining. There are indeed a few Metalls and Battons and such still around albeit with minor changes, so perhaps that’s because their designs are so enduring? 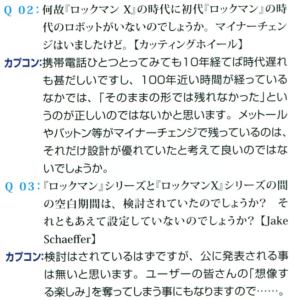 Q03: Has what happened in the interim between the Rockman series and the Rockman X series been decided? Or is there no canon version of what happened? 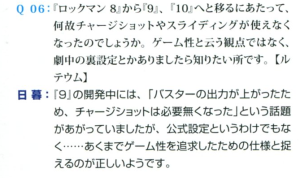 Q06: So sometime after Rockman 8 and before 9 and 10, use of the charge shot and sliding were lost. 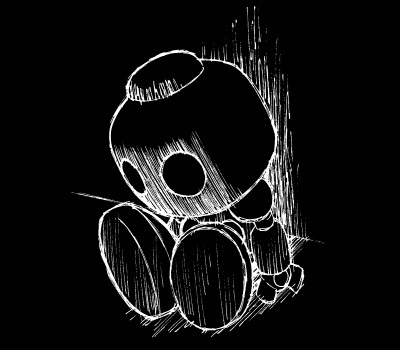 I want to know if, outside of just being a gameplay thing, is there any canon story-related reason for this? 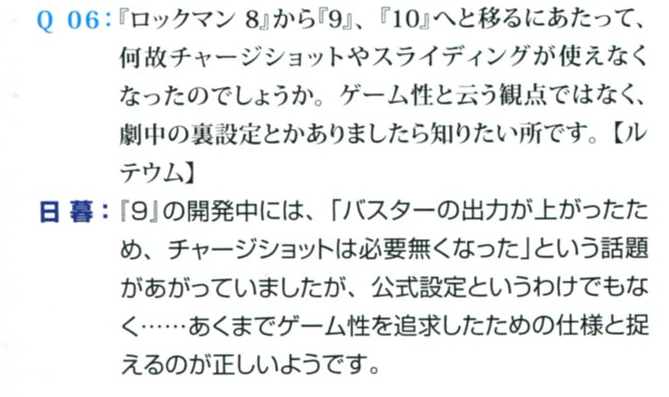 Higurashi: While we were working on 9 there was an idea tossed around around that went “the Rockbuster’s output was increased, so charging a shot became unnecessary.” But, as far as the official story is concerned… The truth is, it was regarded mainly as a gameplay aspect and nothing more. 6 Comments to "The times, they are a-changin’"
Well, it’s nice that they don’t want to invalidate anyone’s theories on the Classic –> X gap, but still…what a letdown. I take question 2 to be talking about the Mechaniloids, rather the humanoid precursors to the Reploids. Their logic is sound when you exclude the sentient robots, and is an otherwise fine addition to the picture they’ve already painted. I don’t see why it couldn’t also refer to the Robot Masters, especially if the law that limits their lifespans is still in effect. The problem with assuming that the lifespans are in effect is that you get to wonder where those time spans are on Reploids then. Interesting idea on the charge shot being unnecessary… at least until you see X and on using it. This shows that X can indeed be damaged by classic Mega Man, mainly because if a simple met can damage X, why not Rock?